Jewelry is going to some new and exciting places this year, and you do not want to miss some of these new pieces, gem combinations, and hybrids. The latest pieces to walk down the catwalk will surprise you and make you giddy with their big, bold cuts and takes on color. In your own shop, reach for rough-cut gems, bright colors, and big, crazy combinations to put yourself on the cutting edge of what’s trendy and happening right now. Your own collection of gemstones needs to be a lot more colorful this year, both for your sake and that of your customers. One look at this year’s fashion week will convince you that colorful can open doors you didn’t even know existed. Earrings are a hot trend! In high concept earrings like these unique pieces, which Vogue dubbed “The Art School Earring,” the shapes look more like non-jewelry pieces. All of them are fresh and fun and provide inspiration for some truly exciting new designs. Keep them big and energetic—nothing about 2017 is understated. Speaking of statements, these statement earrings have been spotted on the latest runways and the ears of glamorous celebrities. Isabelle Huppert wore an ear climber made of diamonds to the Oscars, and Charlize Theron wore giant dangling diamonds. While the rich and famous can have fun with their precious gems, the rest of us can play with more affordable and fabulous shapes and colors. Some of these earrings were so large their designers sent them out as a single piece as opposed to a pair. Mary Katrantzou created a gorgeous, sculptural leaf painted in purples and blues that was bold enough to stand on its own as opposed to sitting next to a twin. Designer Rodarte created a truly bizarre hybrid of necklace and earring that connects the chain in the space between the chin and the clavicle. Refusing to play it safe, he went big on one side with a dangling chain hanging from a sparkly flower design, and then a jeweled chain floating above the collarbone. The look is new and innovative, and one that any designer should take a crack at if only to push one’s skills in the workshop. Rodarte’s designs inspired other designers like Maison Margiela and Katrantzou to redefine what an earring can and can’t be. Katrantzou’s trailing string of leaves from the earlobe to the opposite shoulder is a whole new look for this season, and it celebrates the asymmetrical look and gives a new edge to jewelry that many would admire but be afraid to wear themselves. Margiela’s silver hoop necklace hangs under the chin like a redefined stethoscope with big, chunky rhinestones hanging down to dress up a great piece of clothing in a whole new way. It looks especially great with a flat, shiny headband in a bold color. Once again, designers are aiming high and achieving all kinds of greatness up there. The statement necklace is always a fun piece to play with, and this year is no exception. Low-hanging, heaving pieces laden with different colored jewels are celebrating the fabulousness of accessorizing, and designers are rushing to out-statement one another with each show. First off, there’s an art deco disconnected collar from Prada. Always looking for what’s next, this season the designer took off to a new level with this great, asymmetrical, and open design that challenges how necklaces are worn and how they look. Next is Givenchy, who designed a statement necklace that was so low it touched the model’s waist, breaking up a rather square outfit with a wild piece. The necklace itself is heavy, with a great pendant with pieces of turquoise and sparkling diamonds throughout the piece and a huge agate stone in the center. Finally, Chanel went for a simple string of sparkles with tons of diamonds leading down to a massive, low-hanging pendant that pairs beautifully with a big, singular earring. Off the runway, statement necklaces are popping up from lots of different jewelry makers and in all the boutiques. Onyx looks great in a heavier, multi-strand design and shines without the help of a lot of colors, though it also pairs beautifully with pearls or deeply hued gems. Many necklaces are showing off their design prowess and new styles with an asymmetrical bent. By balancing out big, heavy stones with small, light touches like this piece with a drop rhinestone and airy flowers, designers can expand their horizons and help customers develop a great new look. 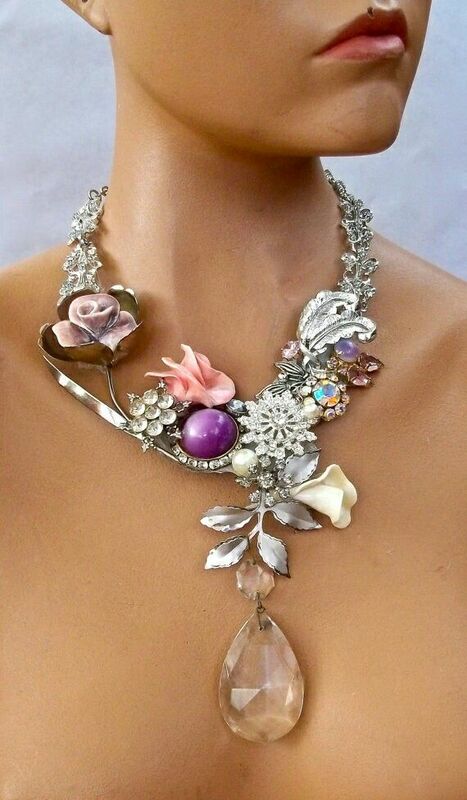 This look can also be a throwback if vintage jewelry inspires you, such as this great piece that creates flowers with pearls, silver, and rhinestones. Arm cuffs and hand cuffs are looking to the future with some brassy gold, big, mechanical designs and shiny pieces that can change any outfit into something special. Designers Courrège, Loewe, and Louis Vuitton played with the concept of cuffs in the spirit of large, more daring jewelry on the runway and inspired a slew of designers aspiring to join them at next year’s Fashion Week. Not to be outdone, designer Lanvin created a bracelet that flows down the hand into a piece that completely covers the fingers when the arm is extended and becomes more of a fringed bangle any time the arm is bent. 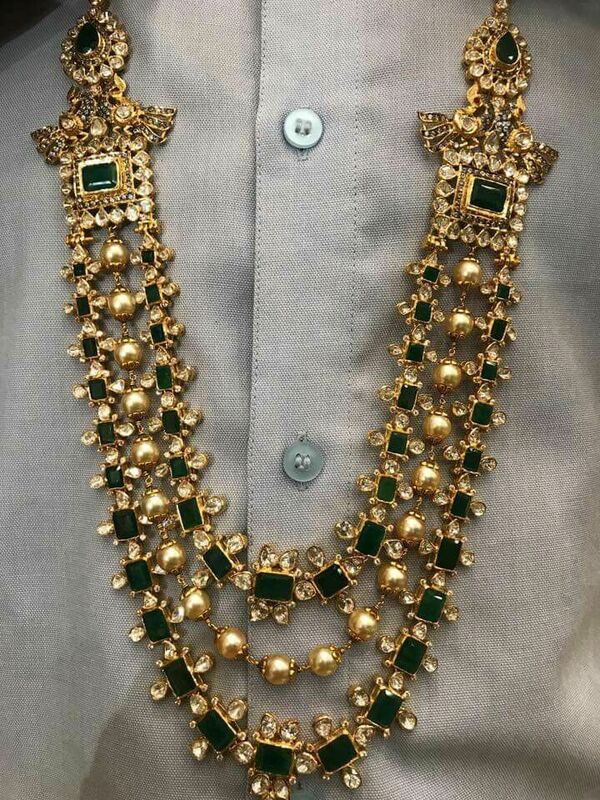 Once again, we see that jewelry is being called to be something new or to combine two ideas into one. Don’t forget your ring. A ring, or a set of rings, can be the finishing touch to any outfit. This year, rose gold is making a big splash to add to the ever-expanding set of colors for designers to play with. Rose gold is a combination of gold and copper, giving the metal a sweet, rosy glow. Give it some edge with a fun design like this great skull ring,which takes advantage of the innocent color and makes it surprising as opposed to saccharine. Fashion Week in Milan saw some equally fun pieces, including this sculptural, insect-inspired piece that almost takes over the whole hand. While it doesn’t feature any gems, it does have some great metal work and tons of fun details that any jewelry fan would love to wear. Don’t hold back on your own designs—take a deep dive into whatever things in nature inspire you and go for it. Roxanne Burg has recently fallen under the spell of crystals. She’s working on increasing her knowledge of their healing powers and how to use them for heightening her vibrational frequency. Roxanne also loves night swimming on Folly Beach and reading metaphysical books. She blogs for BeadsofCambay.com and TheBeadTraders.com. Roxy loves the multifaceted world of gemstones, beaded jewelry making, and crafting in general. When she isn’t blogging for BeadsofCambay.com and TheBeadTraders.com she’s most certainly got a glue gun in one hand and a bead reamer in the other. She’s a stay at home mom with two very creative daughters. There is always some glitter on the floor and a project that needs completing. Can you crafting moms relate? How to deal with emails more efficiently to save time and your sanity!